This page takes a look at some of the options for listeners looking to listen to radio over the Internet. In the mid-1990’s we saw the start of a small but growing collection of Internet radio stations stringing up worldwide. 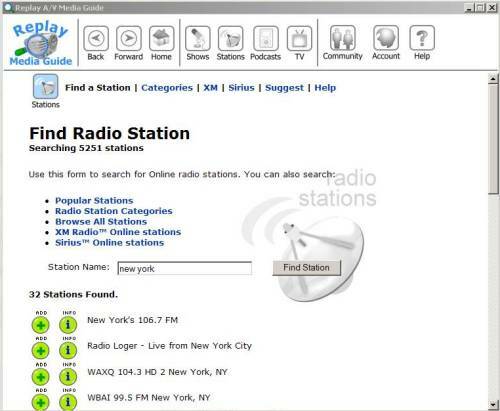 Using “streaming audio” technology, webcasting (as it’s now commonly known), brings radio stations from around the world within easy reach via your desktop computer. Many of the UK broadcasters offer a streaming radio service over the Internet, often tied into the station’s website. Viewing a station’s website allows you to the faces behind the voices (and shatter some illusions! ), in some cases see what’s happening live in the on-air studio via a studio webcam, plus send email or instant messages to the on-air presenter. To listen to Internet radio stations, you’ll need a broadband connection. You’ll also need an Internet Radio receiver. This could either be a stand-alone radio receiver, a desktop computer or laptop, or a mobile phone with suitable Internet radio software. Here’s a list of some of the stand-alone Internet radios available in the UK. Typically, these use wi-fi to get their Broadband. You’ll need a wireless Internet router. 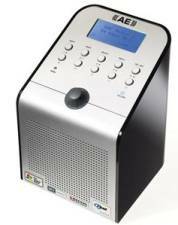 This is a combined DAB digital radio, FM radio with RDS, and Wi-Fi internet radio (easy access to over 9,000 stations from around the world). 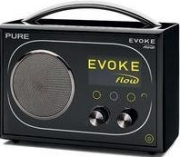 Released in December 2007, it’s the first commercially-available radio to support the upcoming DAB+ standard. The Blik has an alarm clock and allows you to plug-in your MP3 player and use BLIK as a loudspeaker. We looked at this in Show 24 of our podcast. More details on our Revo page. Supports Internet radio, DAB and FM radio. Also supports podcasts, Listen Again and media streaming. The Acoustic Energy Wi-Fi Internet Radio makes use of an existing wi-fi network, to access the world’s Internet stations without relying on a USB dongle connected to a PC. This is the world’s first radio capable of accessing over 99% of Internet radio stations broadcast anywhere in the world. Compatibility with all three major streaming formats gives the Wi-Fi radio an amazing choice of content from Britain’s BBC Radio1 to Brazil’s Radio Calypso! There’s no subscription to pay, no signal coverage problems and no international content boundaries. You can search by country or genre, and the formats Real Media, MP3 and WMA are supported. The Acoustic Energy Wifi radio is available for between £150-£170 from Play. The Logik Ir100 Internet Radio provides access to over 5,000 online radio stations, using your broadband connection. It also allows you to stream audio files from your PC, supporting Real Audio, MP3, WMA, AAC, WAV and AIFF formats. This supports up to 1000 stations and can also stream music from your PC. Available for £69.99 from Argos (Cat No: 049/0380). Access to over 5,500 Internet radio stations. The Pico wi-fi has a built-in rechargeable battery, offering completely wireless access to Internet radio stations. Supports Windows Media, Real Media and MP3 formats. Can be connected to an iPod and has FM radio. With infrared remote control. More details at www.revo.co.uk or on our Revo page. Available for £149.95 directly from Revo. Available for £99.99 from Argos (Cat No: 049/0531). The Joggler is marketed by mobile phone firm o2 as a device to keep your family in touch – sporting a shared calendar, media device (photos, music and video), and information portal (news, sports, weather and travel). 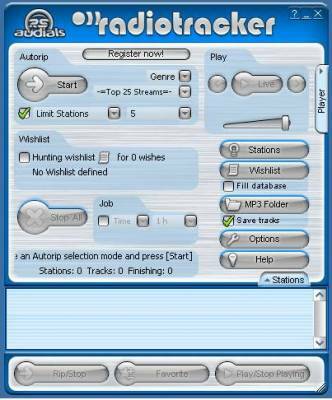 In November 2009, a free upgrade to the o2 Joggler software added Internet Radio, using Pure’s Lounge Internet radio service, bringing access to an initial 100 radio stations. o2 Also dropped the Joggler’s price to below £100. A handy device that does a lot more than Internet radio – well worth a look. This device connects to your hi-fi and adds Internet Radio. It supports access to over 5,500 radio stations from around the world. It has two standard RCA phono outputs, for connection to your AUX inputs on your hi-fi or home cinema. More details on our Revo page. Supports Windows Media, Real Media and MP3 formats. Connects to your wi-fi broadband Internet connection. Stylish unit with remote control, alarm clock and presets. Available for £99.95 directly from Revo. In many cases, Microsoft’s Media Player, or Real’s RealPlayer will be perfectly fine for accessing streaming radio stations over the Internet, but you may find you’re better off with a dedicated Internet Radio software package. In this section, we take a look at two or three of the top Internet radio packages available. This package, formerly known as Replay Radio, is the team’s personal favourite. It offers access to radio stations, old radio shows, podcasts and even streaming TV stations. We reviewed this product in show 15 of our podcast and at the time of recording in May 2007, Replay AV was carrying 5,251 radio stations, 1259 shows 511 TV stations, and 20,700 podcasts – you can also add your own favourite feeds if they’re not listed. Searching with this application is very easy, and the Record wizard makes it easy to get a copy of what you’re listening to, or to schedule a future recording. We wouldn’t hesitate to recommend this to anyone. Magix Webradio is available for around £18 from Amazon. 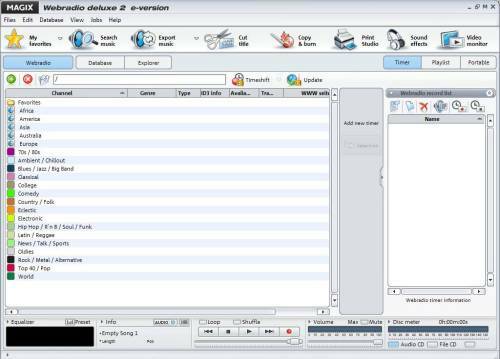 The Radiotracker package also gives you access to lots of Internet radio software, but for a slightly different purpose. Radiotracker comes pre-configured with 14,000 radio stations – and allows you to build a collection of mp3 tracks from the Internet. You can enter the names of tracks and artists you’re interested in, and the software will scan radio stations for those tracks and download them for you. RadioTracker offers a fast way of downloading content from radio stations round the world. If you fancy yourself as a radio presenter, why not look at setting up your own radio station? All you need is a mic, a PC and an Internet connection. If you fancy giving it a try, create a free account at www.live365.com, and set up your own online streaming radio station. Your own station – Looking for a guide on how to get started online? See our Start Your Own Online Radio Station page. First appearing in the mid-2000s, this is regarded by many as a new form of radio. The ‘Podcast’ gets its name from the iPod music player, and is essentially an audio MP3 file that can be downloaded onto your computer and then synced to your portable music player. You can either download files manually, or use software such as iTunes and Juice to get shows delivered automatically. We’d love to expand this section, so please contact us if there’s anything you’d like to know about podcasting. If you’re looking to be able to start broadcasting or recording radio shows from your PC, you might want to take a look at this convenient little starter kit. 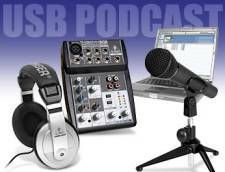 The USB Podcast kit is made by Behringer, a respected name in the broadcast industry. This kit is designed for podcasting, but works for any voice and audio recording you might want to consider. The kit includes a 5 channel mixer, an audio interface that plugs into your PC’s USB port, a dynamic microphone, mic stand, and a set of headphones. It’s supplied with a CD of software, including a package called Audacity – this will allow you to record and mix together a podcast or audio demo tape. See and hear our review. The USB Podcast kit for the PC is available for under £65 from Gear 4 Music. Radio Feeds – A handy site to find out which radio stations are streaming in the UK. I enjoyed the Listen Again service from the BBC. It enabled listening up to 30 days after broadcast. This service was discontinued without notice to the general public following changes to the encoding system. My new Reciever/Amplifier by Denon can no longer access these services. Denon reported that they were not consulted. I have protested to the BBC that they should not have stopped the service without taking account the views of listeners and the industry. To my knowledge there’s never been such a high-handed deletion of a service which the BBC was promoting and recently extended from seven days to thirty. Any comments? January 11th 2016: is anybody out there able to tell me, which internet radio receivers with current HSL listen again streaming -apart from PURE receivers! – are to be had from the UK ?? Names of brands and/or devices would be more than welcome. Thanks very much in advance. Hi how can I get an internet radio licensing?